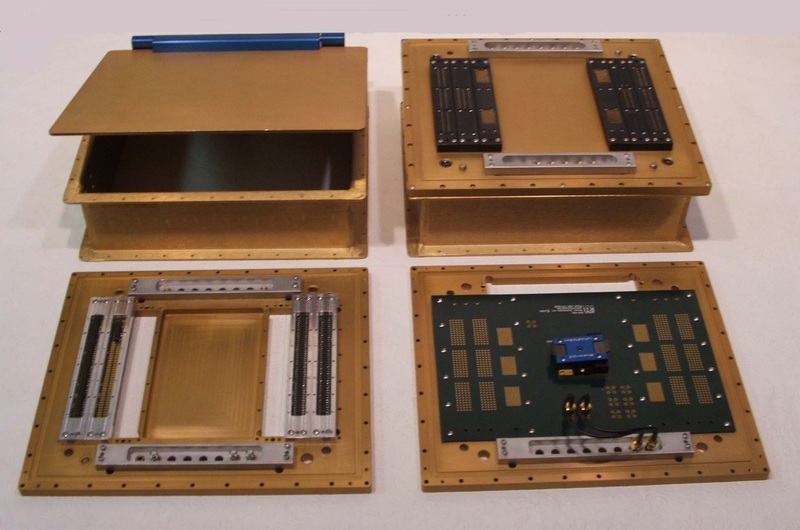 The OA108 modular Omni-Panel comprises a base unit with up to 1320 pogo pin contacts*, and up to 16 x 40GHz blind-mate coaxial RF connections, top right shows an example of a fully loaded base unit which is connected to the PXI or rack and stack test equipment. Bottom left shows the prototype docking head which can then be re-configured when the prototype under test changes. Bottom right shows an example of the Omni-Panel loadboard with a device test socket fitted. Any number of combination of these units can in turn be connected to to the test instrumentation via the base unit. Top right shows an optional EMI shield which can be added to the prototype unit or loadboard thus providing EMI shielding to keep RF susceptibility to a minimum and avoiding the cost of a shielded room! These units are modular and highly flexible, and can be ordered with any number within range of pogo pins and RF connectors, the base unit connectivity to the test equipment is also user-defined, so for example D-connectors could be used for power supplies, coaxial ribbon cable for data, and SMA connectors for any RF connection to the test equipment. Additionally if you decide to order load-boards we will even assist you with the design and configuring the base unit so you get the optimum coverage. Finally because these units are so highly flexible, the prototype, or base units can be reconfigured or upgraded as the needs change. * Less pogo pins are available if higher current, or low-cost pogo pin modules are selected.